There’s an unnamed malaise spreading through L’Immédiat: characters slip from chairs or slump to the ground like dropped coats, crawl and heave to cross the distance of a few feet, have the greatest difficulty standing or walking upright. Even the set has trouble keeping it together. Following an opening scene where the daily routines of a woman and man cross as one returns home and the other prepares to leave — the apartment around them disintegrating in a carefully orchestrated collapse as chairs, tables, pictures, coathangers and beds succumb to the dead hopelessness of it all — the walls of their tiny one-room themselves fall out and reveal a startled-looking long-haired man in a red dress. Exposed, he goes on the run, picking daintily yet clumsily through a vast stage stacked and cluttered with every kind of junk — a towering piecemeal set which, in a bravura piece of slapstick, falls apart around him: cabinets, clothes horses and ironing boards collapse, stage curtains are tangled and torn down, unsecured ladders are climbed and toppled, a stage light is grabbed and swung off, and empty plastic water containers and other debris rain from the ceiling, our man (unpursued, incidentally) haring through this elaborate environmental breakdown until he reaches and disturbs the stage-high tower of cardboard boxes that’s stood semi-occluded at the side of the set this whole time. As it tips, the audience gasps. It’s satisfying to watch the trap sprung, but almost as pleasing are the following scenes where — after a lone cleaner has come out and failed to sweep about six skipfuls of junk under the original apartment’s small rug — the lights suddenly all come on and a knot of hairy Frenchmen in fur coats race on stage in dockers’ boots and, wielding wide brooms, heartily sweep and fling the bric-a-brac stage left and right in the equivalent of a child tidying their bedroom by piling every last object into a wardrobe or cramming it all under the bed. Here for a few minutes as well the whole of the Barbican stage is lit, across and back, revealing towers and piles of junk, and showing you — probably for the first time — a startlingly immense stage-space, in size more like a hangar, in volume feeling almost a mirror of the auditorium. In a matter of five minutes the frenetic activity of the stagehand performers clears a central area, the lights go down (imposing for me the strangest, edgiest sensation, persisting throughout the piece, that the vastness of the stage was still there, and that our peopled space was matched by its void), and with 50 minutes of show remaining, the malaise returns. 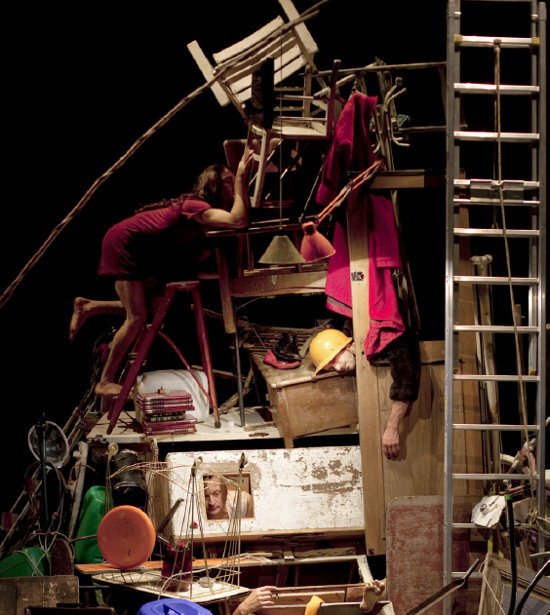 Its pervading listlessness manifests for L’Immédiat’s characters as a constant itching sense of hidden presence and withheld opportunity, or in eerie outbreaks of physical malfunction, but the show itself is most often a farce — performers running in and out of cupboards and appearing from behind the set, crossing paths and switching places. So here’s the problem: L’Immédiat is a dark, existentially barren extrapolation of the entitled conviction that what’s out of reach is always better, but the audience accept it (and are allowed to accept it) as just a piece of clever and weird Gallic comedy. The slender connection that the show seems to be making between the overbearing character of slapstick farce (THIS IS THE JOKE: HERE) and the general unbearable weight and echoing hollowness of moment-to-moment existence I think is broken by the runaway delight the audience finds in the more whimsical physicality — scenes such as those where a performer (the spidery Camille Boitel himself) is tilted at 30 degrees and held up by the fur coat team, who use a broom to brace his middle, the objects of the world around him gradually tilting into his alignment until the whole set is off-kilter; or those where a woman’s limbs are rendered magically lighter than air and she has to be saved by the others dragging her back to earth. As the light levels dip ever lower and the visible stage becomes smaller and more closed-in (that uncanny sense of the unlit stage still pressing through), L’Immédiat interjects a long sequence where the performers crawl as though across desert toward an out-of-reach glass of water, unable once they get to it to even stand to drink it. If as it seems to be this is some commentary on the scarcity of natural resources in a world overfull with obsolete products and discarded luxuries then the pitch of it is bizarre — the audience laughing, the characters gasping and reaching. Either the ideas have no rigour or the company is too involved in their own visual aesthetic to prevent it from obscuring those ideas; I’m not sure. My own experience was that L’Immédiat was intelligent, at times pleasurable, and yet, finally, as shallow as the culture it parodied, its truths drowned out by easy entertainment.